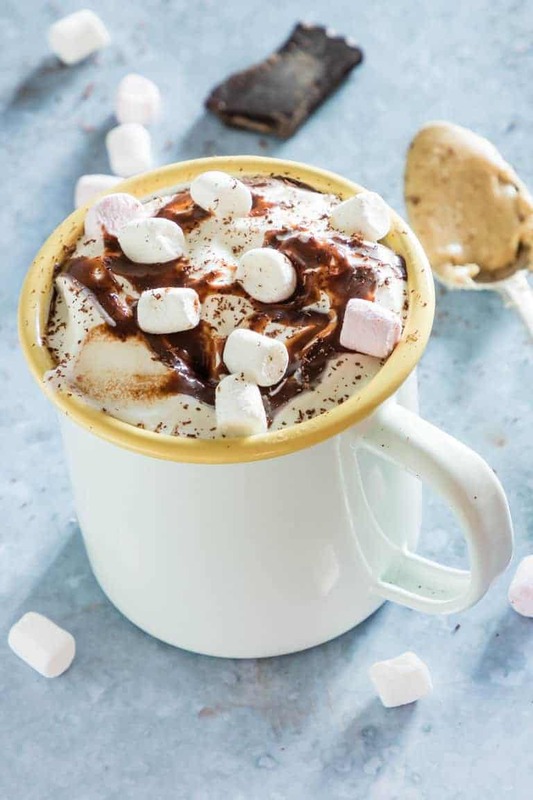 This decadent Peanut Butter Hot Chocolate is the perfect touch up of the classic hot chocolate. 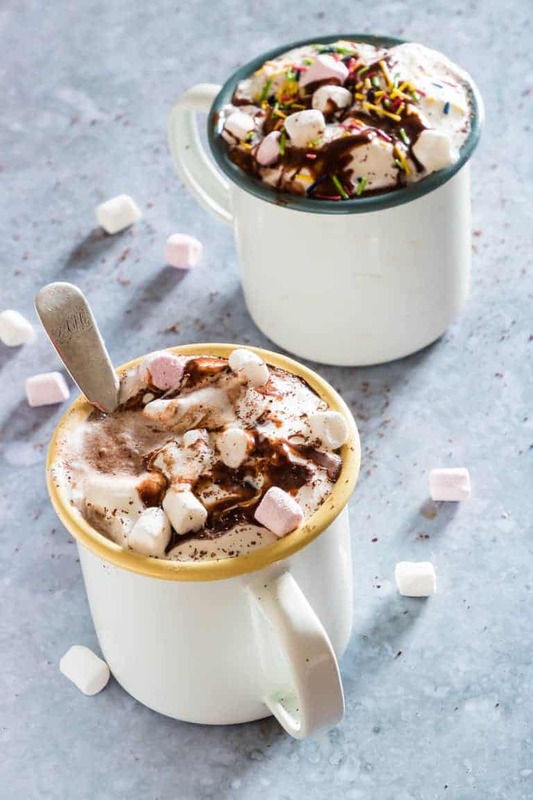 Rich, creamy and made with only 6 ingredients, this comforting hot chocolate is great for cold days, lazy mornings and life’s indulgent moments. Suitable for people following a vegan diet. 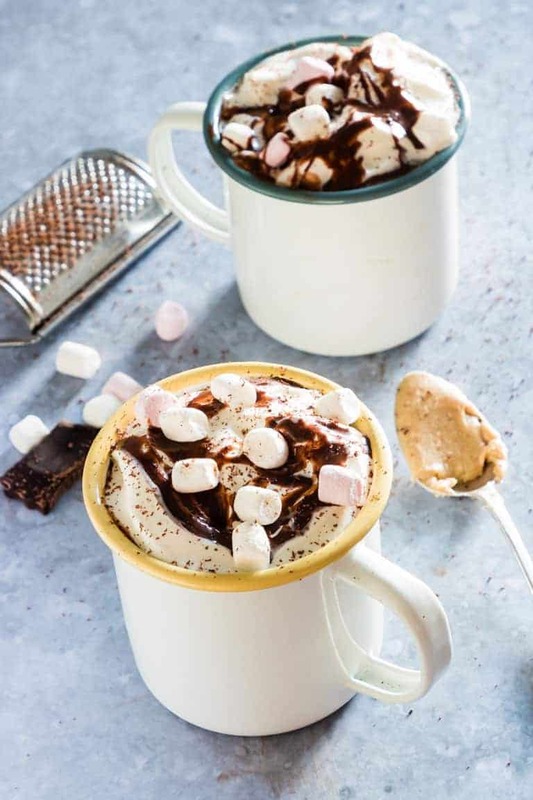 And whilst we can agree that the world might not really need another hot chocolate recipe, let’s stop for a moment and make this decadent peanut butter hot chocolate anyway. Because peanut butter and chocolate make the perfect pairing. 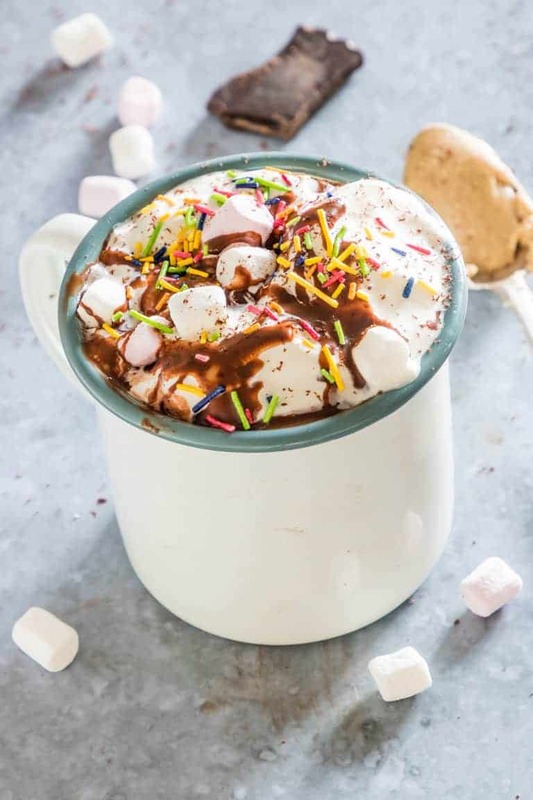 And on frosty mornings and cold, cold, cold winter days, there ain’t nothing better than shedding those scarves, coats and gloves and settling in with a cup of rich creamy hot chocolate, easily made from scratch. Cocoa – Plus all the chocolaty goodness. Peanut butter – adds that creamy goodness that is just so addictive. Dark chocolate – adds that decadent richness to your drink. Sea salt flakes <= amazing salt that makes your hot chocolate taste oh so good. 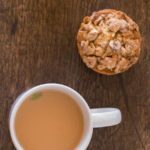 Optional – you can add a sweetener of your choice. I suggest maple syrup. Combine these 6 ingredients combined into the richest, decadent, and moreish cup of hot chocolate you have ever had. Honestly, it blows every other hot chocolate out of the water. This is the perfect pot for whipping up your hot chocolate. You need these awesome handy measuring cups and measuring teaspoons to measure out your ingredients. Sea salt flakes <= amazing salt that makes your hot chocolate taste good. These colourful awesome enamel cups are my go-to serving cups. 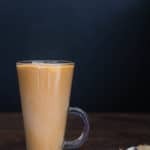 So, are you ready to learn how to make Decedent Peanut Butter Hot Chocolate? Gather up your ingredients and let me show you…. Heat up the almond milk in a small pot until warm but not boiling. Whisk in the cocoa powder, followed by the peanut butter, chocolate, maple syrup and salt. Keep whisking until everything is completely combined (it may take a little while for the peanut butter to blend in). Make sure the hot chocolate does not boil. 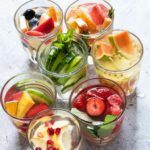 Pour into cups and serve with toppings of your choice. Warm the milk in the microwave and set it aside. Gently melt together the peanut butter and chocolate in a small bowl. Then gradually mix in the warmed milk, followed by the cocoa powder and maple syrup. Re-heat until warm but not scorching. Transfer into cups and then serve with toppings of your choice. Do break the chocolate into small pieces so that they melt quicker. 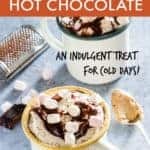 Make the hot chocolate does not boil or scorch as this will affect the flavour. To keep this recipe vegan, please do use dairy-free chocolate and dairy free cocoa powder. Of course, if you are not following a vegan diet then use whatever you prefer. 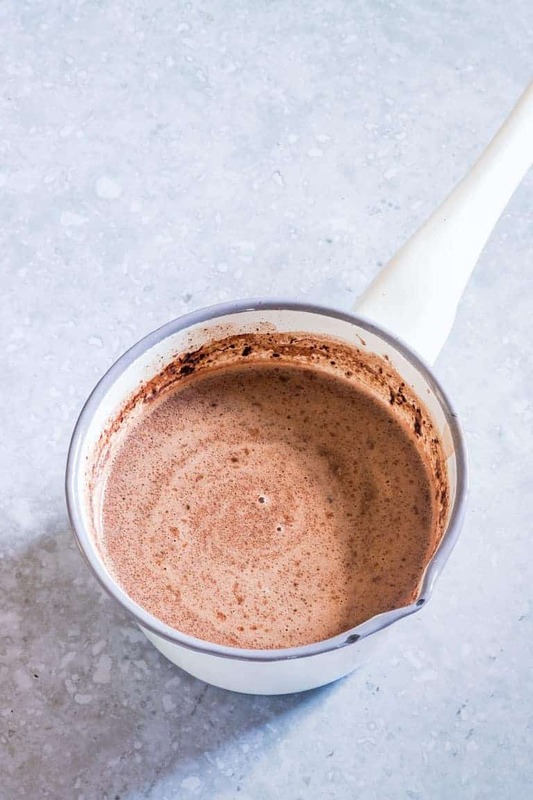 Before I share the recipe with you, I would love to answer some of your hot chocolate questions…. 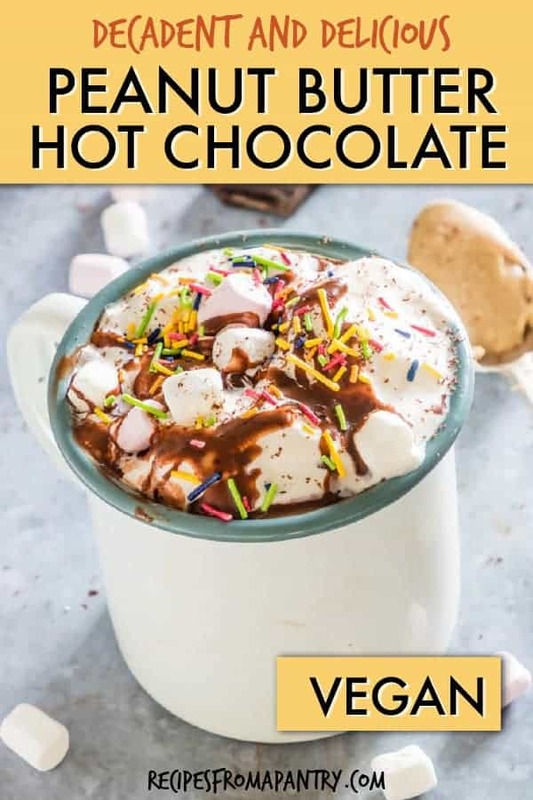 Whilst this recipe gives you two portions of hot chocolate, it is very easy to halve the recipe to make yourself a single portion. Perfect for life’s well-deserved me time moments. You bet we can, which is what we are doing with this recipe. Why not also try variations with almond butter and cashew butter, this is all about what you like. 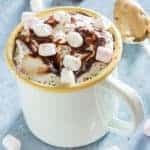 Can you make vegan hot chocolate with cashew milk? You bet you can. 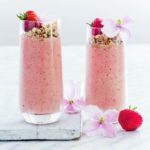 Simply swap the almond milk for cashew milk and you are good to go. Yeap, just use coconut milk instead of almond milk. You would need to use some dairy-free coconut whipped cream to keep it vegan. Vegan Banana Peanut Butter Brownies. 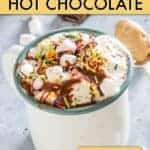 So, here’s to hot chocolate season, cold weather, wood burning fires, me time moments and this decadent vegan hot chocolate, EVERY. Single. Day. Don't forget to tag #recipesfromapantry on Instagram or Twitter if you try Peanut Butter Hot Chocolate Recipe! It is really, really awesome for me when you make one of my recipes and I'd love to see it. You can also share it on my Facebook page. Please pin this recipe to Pinterest too! Thank you for reading Recipes from a Pantry. This decadent Peanut Butter Hot Cholate is the perfect touch up of the classic hot chocolate. Whisk in the cocoa powder, followed by the peanut butter, chocolate and maple syrup. Make the hot chocolate does not boil. Pour into glasses and serve with topping of your choice. Re-heat until warmed but not scorching. Transfer into mugs and then serve with topping of your choice.